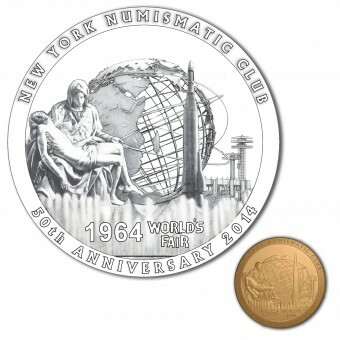 This design was the result of a commission by the New York Numismatic Club for a commemorative medal in Honor 50th Anniversary of the New York Worlds Fair of 1964. 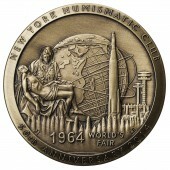 A medallic commemoration of the 1964 New York Word's Fair. This project began with a concept that connects the 1939 New York World's Fair and the 1964 World's Fair both having been sited in Flushing Meadows, New York. It was commissioned by the New York Numismatic Club, which celebrated the 100th anniversary of it's founding in concordance with the 75th and 50th anniversaries of both New York World's Fairs. 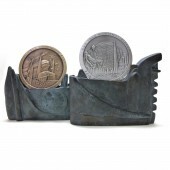 The design was co-ordinatted and intended as a companion piece to the 75th Anniversary of the 1939 World's Fair Medal, which was designed and sculpted by Eugene Daub.My 1964 Design was masterfully sculpted by Luigi Badia. 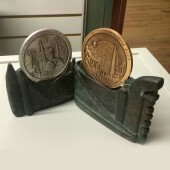 The common base for both medals was designed and sculpted by Mashiko. 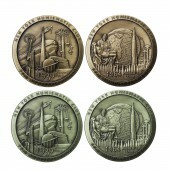 This medal is collected by numismatic connoisseurs and travels widely throughout the public. Exhibited as part of the permanent collection of the Queens Museum, New York City, which is located at the site of both World Fairs. Hand drawn in pencil within a 9 inch diameter circle. This began with a concept that connects the 1939 New York World's Fair and the 1964 World's Fair both having been sited in Flushing meadows, New York. It was commissioned by the New York Numismatic Club, which celebrated the 100th anniversary of it's founding in concordance with the 75th and 50th anniversaries of both New York World's Fairs. I attended the 1964 World's Fair as a 17 year old student of the High School of Music and Art. I was deeply impressed by the power and mystical beauty of Michelangelo's Pieta. It was displayed to the public from behind bullet proof plated glass.The viewers were on a conveyor belt and could only have a frontal view. Still with all these compromises, the divine genius of Michelangelo's creation was evident to all. 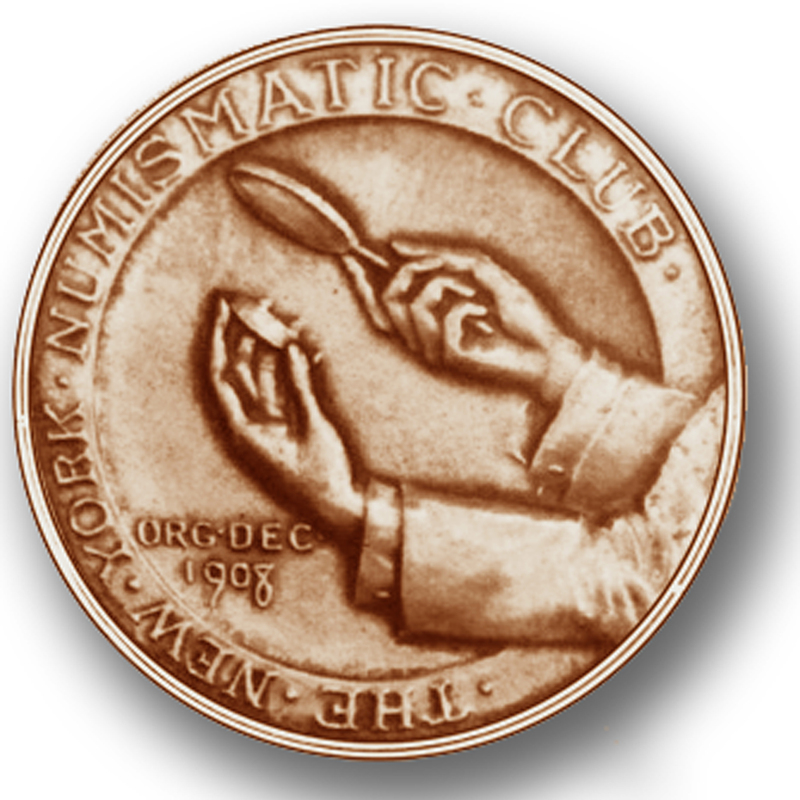 The New York Numismatic Club is the preeminent numismatic club in America having been founded in 1908. It has been true to it's motto" An Island of Civility" for over 100 years with a membership of eminent scholars, historians, connoisseurs, collectors and artists.The club has held it's it's monthly meetings continuously, uninterrupted by two World Wars and the events of 911. 50th Anniversary 1964 World's Fair Bronze Medal by Joel Iskowitz is a Nominee in Excellence in Design Category. · Click here to register today inorder to be able to view the profile and other works by Joel Iskowitz when results are announced. 50th Anniversary 1964 World's Fair Bronze Medal by Joel Iskowitz is Winner in Excellence in Design Category, 2014 - 2015. · Read the interview with designer Joel Iskowitz for design 50th Anniversary 1964 World's Fair here. · Press Members: Login or Register to request an exclusive interview with Joel Iskowitz. · Click here to register inorder to view the profile and other works by Joel Iskowitz. Did you like Joel Iskowitz's Excellence in Design Design? Did you like 50th Anniversary 1964 World's Fair Bronze Medal? Help us create a global awareness for good excellence in design design worldwide. Show your support for Joel Iskowitz, the creator of great excellence in design design by gifting them a nomination ticket so that we could promote more of their great excellence in design designs.